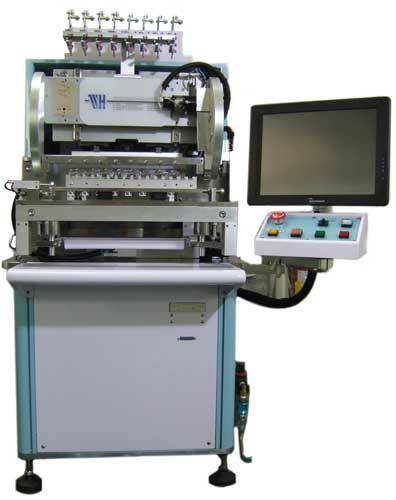 A high speed fully automatic coil winding machine with advanced PC control of multi axis servo systems, for winding inductive devices with fine wire in medium and large volume. 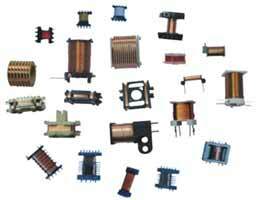 Applications include relay coils, magnetic head coils, LCD coils, transformers, ignition coils, inductors, sensor coils, solenoids, and other bobbin-wound products. Wire cutting on bobbin pin, nozzle cut or by air nipper (method can be chosen by operator and setup in the program). Simplified programming with teach-in programming system using 15 inch touch screen, Windows™ based graphical interface, industrial PC with USB, Ethernet network and DVD ROM facilities. Easy to change tooling and machine set-up recalled from the onboard computer when changing product. Air nipper for larger wire. Load and unload shuttle transfer system.